Caller argument: But builders aren’t building affordable housing. Me: Sigh. Builders build what they think will sell, and if they think a house that will sell for $400,000 will sell as fast as a house that will sell for $150,000, guess which they will choose to build. Quick note here: it does not cost the builder $250,000 more to build the more expensive house either. Profit is a big motive here. Caller argument: But there is a lack of affordable housing. Me: Big Sigh. Affordable for whom? Do we want a house available for everybody in Grand Forks? Why? That is ludicrous, especially when we continue to impose constraints on the market all by ourselves. What type of house, what location, what school area, and so on. In addition, if we think of only “houses”, ignoring all the apartments built in Grand Forks in these last few years, we are further constraining ourselves away from consideration of the total number of dwellings. Caller argument: Aren’t we saturated with apartments. Me: Sigh. Well the amount of building is clearly significant, but I fail to believe all these developers expect to lose money on these investments. Okay, prediction for how my radio appearance this morning will go is now over. It is this type of discussion, or I am going to be hearing about Twins baseball. There’s a no win situation for you. I think a data update on housing prices is in order. Here is the latest from the FHFA all transactions index. One of the very interesting things here is the consistency of the overall movements in the three North Dakota metro areas. It is also interesting that their movement is generally consistent with the movement of US prices overall. 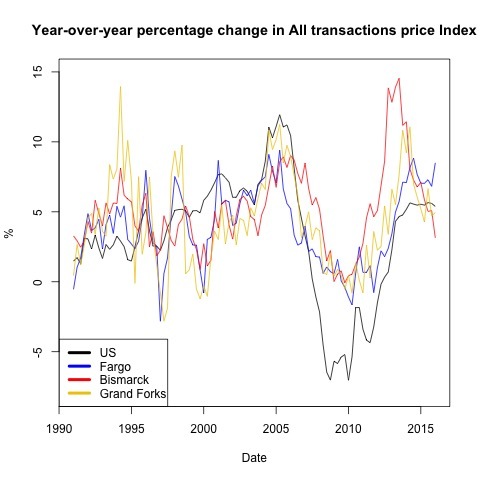 The data show the hottest market in North Dakota after 2010 was Bismarck, though the price changes in Fargo and Grand Forks were significant too. The graph also shows that price increase in the ND metro areas are abating a bit too. Do I think this is going to stop people suggesting Grand Forks is an example of housing market failure? No, I do not. However, I think the question would need to be expanded to look at whether all three metro areas are examples of market failure. (Hint: they are not).